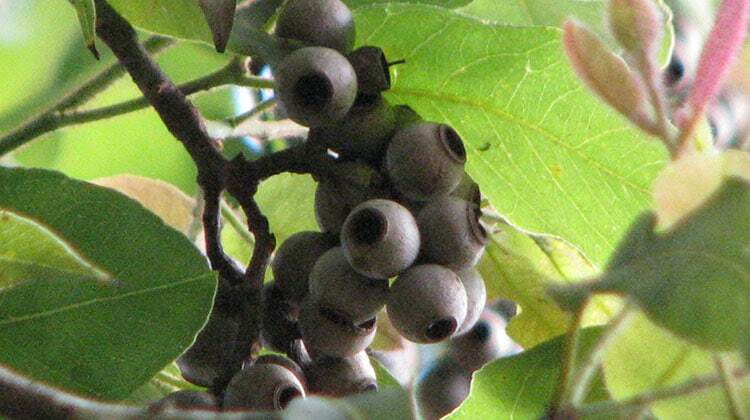 Cadaghi are yet another example of an endemic tree that enjoys taking over civilized life. 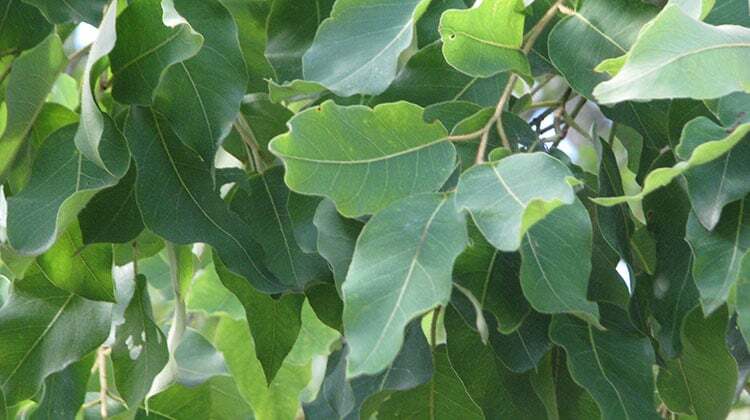 Especially invasive, this tree has been banned from cultivation in many parts of the world including Brisbane, where we recommend removing them. Despite all of its positive characteristics that it’s developed in the wild, these same characteristics make it a very tiresome and unsuitable plant for cultivation in urban areas. And, at first glance you might not realize that this is a gum tree, as its leaves are very wide for a bloodwood. The Cadaghi is considered a medium to large tree, reaching around 30 metres in height and around as wide. It’s usually large and open form is imposing yet unique. It usually holds its branches in every direction, and in cultivation heavily benefits from careful pruning to train it into a suitable and attractive form for the landscape. Left on its own, it grows large and full and in every direction at once. The trunk contains some amount of chlorophyll that helps it photosynthesize and create food. Its color is a light greyish green and usually smooth. 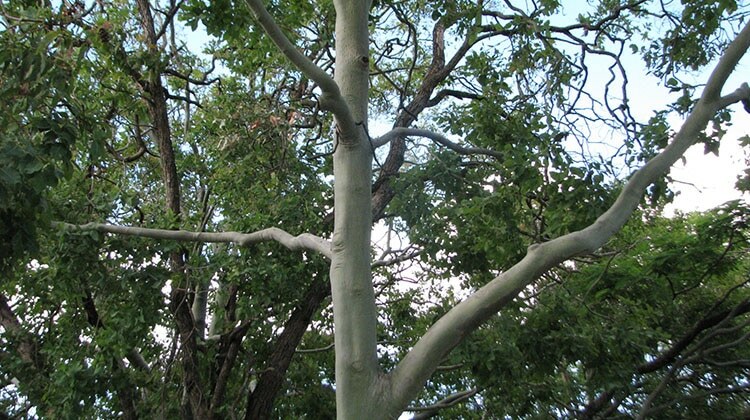 This tree is usually found with a single short trunk where it begins to immediately branch out with main stems above the single trunk. The flowers are very fragrant and white, and are highly attractive to pollinators. This tree blooms throughout the warm season. Don’t necessarily expect a eucalyptus-like leaf from this tree. The leaves are broad, fuzzy, soft, and young growth leaves are reddish bronze. The nuts of this tree are used by many, and in its native range, the attractiveness of this tree’s nuts are part of the reason why it is easily controlled from growing out of control. Bees use a resin found in these nuts to make their nests. You can find these nuts available online as some enjoy using these, and they are also enjoyed by wildlife as a food source. The nuts are urn shaped and green. The Cadaghi is easily started from seed. So easily in fact, that it’s very invasive! You can sow seeds into pots, or plant them right away before the first frost in the ground. Germination is fast, or can take a few weeks. Trillianas require little care once established. They enjoy lots of sun and even some shade when young, and are grown in all sorts of soils as long as they’re well-draining. This tree doesn’t require a lot of feeding or special watering. You can help avoid spreading this tree by collecting the nuts, or bagging the flowers when they appear to stop them from pollinating and creating nuts in the future on smaller trees. Remove seedlings as you find them too. Take special care to avoid planting this tree near buildings, as it’s known to create a sap that is loved by a black and unsightly mould. When the sap is moved with high winds, the mould finds it where it lands- on houses and buildings, on cars, on anything. It’s very hard to remove and clean. We live in a life style resort, and have a large cadaghi tree within 20 metres of 3 villas. The tree is causing us concern. It has shed branches and copious amounts of bark ,last summer. 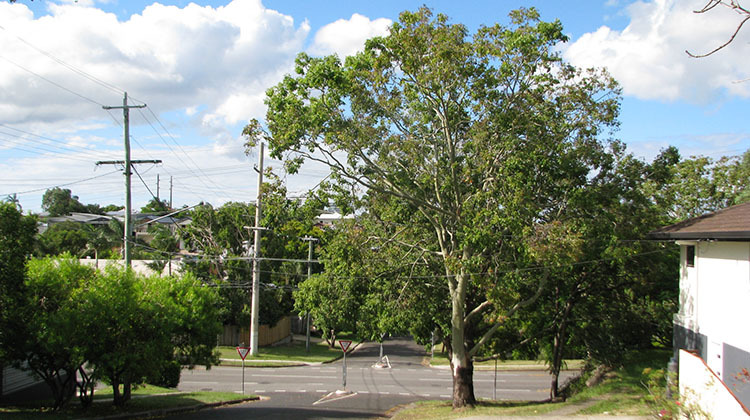 Tweed Council has said it could be removed,.An arborist inspected the tree and stated the tree “has excellent vitality”. therefore no action was taken. The tree is now flowering, attracting bats and creating significant mess each morning. Your comment regarding the sap which in turn attracts mould is of particular concern given our closeness to the tree. How best to remove the sap/mould if it appears? Also is there any information on health issues with the small fibres from the flowers which covers our homes, as I am asthmatic. David can you tell me if it would be possible that the vegie garden under the drip line of the Cadagi tree could become toxic (so to speak) We have replaced the soil in all our vegie gardens and the others are doing great except this one. I realise it could be the roots sapping the moisture??? but when the flowers are out the garden becomes covered in total with the yellow of the flowers and then we get the bulbs of course and trees have been known to come up by the dozens in this garden?? Thanks any advice would be helpful. Unfortunately the tree is not in our yard. I feel your pain. Councils can be very frustrating to deal with. I’d be phoning back the tree department of your council with the new problem about the water pipe, to start. You are quite right about a large tree making it difficult for neighbouring trees to be able to compete for resources. Unfortunately that’s not something your council is going to care about, though. I’d suggest pointing out the dangers. Liability is something councils do care about. Of course it’s much better if that is coming from a third party, so you’ll have to weigh up if you are prepared to pay for a visit from a local arborist who can check the tree for faults. I’d suggest a phone call or two to see if you can find a sympathetic ear. You might find an arborist who will drop by to have a look without charge, though if it gets to the point of a written report you’ll have to pay a fee. 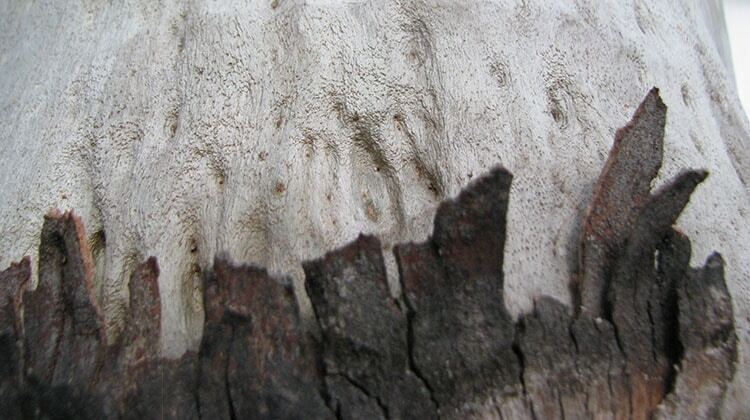 Most arborists are going to be on your side, considering the invasive status of Corymbia torrelianas.